Controversy exists among medical experts regarding the role protein plays in maintaining optimal health. They debate about when to consume it, how much to consume, and what type is best, especially for athletes and highly active people. While maintaining nitrogen balance is critical for health, studies now suggest that the RDA may not be the amount of protein needed to promote optimal health. To achieve that, they say, more protein is needed, and studies now suggest that athletes, active people, and older individuals require even more. Dietary proteins are in a constant state of flux in the body, being broken down into amino acids, transformed into other compounds, and sometimes reassembled into other proteins. They also are used for energy, a mechanism that increases when energy intake is low or when protein intake is inadequate. Muscle protein then becomes a source of energy, resulting in a negative nitrogen balance. This is a critical concern for athletes, who are regularly involved in energy-demanding activities. It stands to reason then that athletes and active individuals would require more protein, and high-quality proteins, on a daily basis than those who spend their days sitting at a desk in front of a computer screen. (High-quality proteins contain all nine essential amino acids in amounts similar to amino acid requirements; animal proteins are higher quality than plant proteins.) While adequate high-quality protein is critical for good health and optimal athletic performance, the amount needed isn’t the one-size-fits-all recommendation the RDA suggests. Today’s Dietitian spoke with experts to determine the latest protein requirements for athletes and highly active people. According to Nancy Clark, MS, RD, CSSD, a sports nutrition counselor and the author of Nancy Clark’s Sports Nutrition Guidebook, different protein recommendations aren’t needed for men vs. women. “[They’re] based on grams per kilogram of body weight,” she says. In addition, active people shouldn’t focus on protein alone. “Have protein/carbohydrate combinations, protein to build and repair muscle tissue and carbs to fuel.” The ratio of protein to carbohydrate can vary greatly, depending on protein intake. Unlike endurance training, single sessions of resistance exercise, regardless of workout length or intensity, don’t appear to increase protein use during the workout itself. However, amino acid uptake after a resistance training session does increase, indicating that the amino acids are being used for muscle repair and construction. Protein utilization appears to be higher for individuals who are less fit. Athletes aside, “Most people eat only about 10% to 15% of total protein in the morning, about 20% or so in the afternoon, and the remainder at dinner. Since our bodies don’t store protein, spreading that intake more evenly throughout the day would be beneficial,” Mohr says. Frequently, concerns are expressed about the possible negative health effects of high-protein intakes; however, an upper limit for protein intake hasn’t been established, though the Dietary Reference Intakes warn against exceeding the acceptable macronutrient distribution range.1 It’s important to bear in mind that if calories are limited, high protein intake may displace other important nutrients. Probably the most common concern expressed is that high-protein intakes may impair renal function. It’s true that protein intake, beyond that which supports nitrogen balance, promotes urea formation, and can increase glomerular filtration rate and kidney nitrogen load. There’s little evidence that the change in glomerular filtration rate can cause problems in healthy people, as the clearance of urea becomes more efficient with higher protein intakes.15 However, lower protein intakes, based on an individual’s weight and the severity of their condition, are recommended for those with impaired renal function. For healthy people, a recent study suggested a maximum intake of 2 to 2.5 g/kg of body weight per day, totaling 176 g of protein per day for an 80-kg (176-lb) individual consuming approximately 2,900 kcal daily.16 This translates to about 25% of calories from protein within the range of 10% to 35% recommended by the 2010 Dietary Guidelines for Americans and the maximum of 35% by the acceptable macronutrient distribution range. High-protein diets that consist of excessive intakes of 200 to 400 g/day can exceed the liver’s ability to convert excess nitrogen to urea and lead to nausea, diarrhea, and even death.12 “I think the biggest message is to avoid the absurd—30-oz steak dinners or carrying around a gallon container of a protein drink all day,” Paddon-Jones says. Developing an individualized nutrition plan for athletes should take into account the individual’s health history, the sport he or she plays, weekly training regimens, time of competition, access to food, and travel schedules. When working with athletes, dietitians must gauge a person’s readiness for change before offering guidance. Moreover, sports nutrition professionals should discuss the athletes’ goals and concerns, answer questions, and ask for the athletes’ participation in their meal planning. — Densie Webb, PhD, RD, is a freelance writer and industry consultant based in Austin, Texas. • Develop a meal plan that will supply adequate calories, carbohydrate, and protein each day. • Distribute the protein equally across meals. • Base protein intake on weight, not on percentage of calories. • Base protein intake on the individual’s sport and intensity level. • Recommend that active, older individuals boost protein intake, as some may require more to help preserve muscle mass. • Suggest protein powders to individuals who need added protein on the go and whose calorie intake is low. 1. Institute of Medicine Food and Nutrition Board. Dietary Reference Intakes: Energy, Carbohydrates, Fiber, Fat, Fatty Acids, Cholesterol, Protein, and Amino Acids. Washington, DC: National Academies Press; 2002. 2. Fink HH, Burgoon LA, Mikesky AE. Endurance and Ultra-Endurance Athletes: Practical Applications in Sports Nutrition. Sudbury, MA: Jones and Bartlett; 2009. 3. Phillips SM, Van Loon LJ. Dietary protein for athletes: from requirements to optimum adaptation. J Sports Sci. 2011;29(Suppl 1):S29-38. 4. Colombani PC, Mettler S. Role of dietary proteins in sports. Int J Vitam Nutr Res. 2011;81(2-3):120-124. 5. Timmerman KL, Dhanani S, Glynn EL, et al. A moderate acute increase in physical activity enhances nutritive flow and the muscle protein anabolic response to mixed nutrient intake in older adults. Am J Clin Nutr. 2012;95(6):1403-1412. 6. Campbell B, Kreider RB, Ziegenfuss T, et al. International Society of Sports Nutrition position stand: protein and exercise. J Int Soc Sports Nutr. 2007;4:8. 7. Layman DK. Protein nutrition, meal timing, and muscle health. In: Berdanier CD, Dwyer JT, Heber D, eds. Handbook of Nutrition and Food. 3rd ed. Boca Raton, FL: CRC Press; 2013:861-867. 8. USDA National Nutrient Database for Standard Reference, Release 26. US Department of Agriculture Agricultural Service website. http://www.ars.usda.gov/Services/docs.htm?docid=8964. 9. Poole C, Wilborn C, Taylor L, Kerksick C. The role of post-exercise nutrient administration on muscle protein synthesis and glycogen synthesis. J Sports Sci Med. 2010;9(3):354-363. 10. Phillips SM. Dietary protein requirements and adaptive advantages in athletes. Br J Nutr. 2012;108(Suppl 2):S158-167. 11. Burd NA, West DW, Moore DR, et al. Enhanced amino acid sensitivity of myofibrillar protein synthesis persists for up to 24 h after resistance exercise in young men. J Nutr. 2011;141(4):568–573. 12. Mamerow MM, Mettler JA, English KL, et al. Dietary protein distribution positively influences 24-h muscle protein synthesis in healthy adults [published online January 29, 2014]. J Nutr. doi: 10.3945/jn.113.185280. 13. Energy intakes: percentages of energy from protein, carbohydrate, fat, and alcohol, by gender and age, what we eat in America, NHANES 2009-2010. US Department of Agriculture website. http://www.ars.usda.gov/SP2UserFiles/Place/12355000/pdf/0910/Table_5_EIN_GEN_09.pdf. Accessed March 28, 2014. 14. Fulgoni VL 3rd. Current protein intake in America: analysis of the National Health and Nutrition Examination Survey, 2003–2004. Am J Clin Nutr. 2008;87(5):1554S-1557S. 15. Walrand S, Short KR, Bigelow ML, Sweatt AJ, Hutson SM, Nair KS. Functional impact of high protein intake on healthy elderly people. Am J Physiol Endocrinol Metab. 2008;295:E921-E928. 16. Bilsborough S, Mann N. A review of issues of dietary protein intake in humans. Int J Sport Nutr Exerc Metab. 2006;16(2):129-152. 17. Jesudason DR, Pedersen E, Clifton PM. Weight-loss diets in people with type 2 diabetes and renal disease: a randomized controlled trial of the effect of different dietary protein amounts. Am J Clin Nutr. 2013;98(2):494-501. 18. Sahni S, Broe KE, Tucker KL, et al. Association of total protein intake with bone mineral density and bone loss in men and women from the Framingham Offspring Study. Public Health Nutr. 2013;29:1-7. doi:10.1017/S1368980013002875. 19. Heaney RP, Layman DK. Amount and type of protein influences bone health. Am J Clin Nutr. 2008;87(5):1567S-1570S. 20. Bonjour JP. 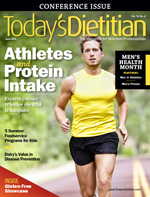 Dietary protein: an essential nutrient for bone health. J Am Coll Nutr. 2005;24(6 Suppl):526S-536S. 21. Bonjour JP. Protein intake and bone health. Int J Vitam Nutr Res. 2011;81(2-3):134-142.